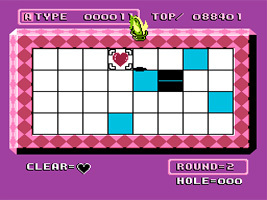 A puzzle game featuring of a series of tiles with a single chess Knight, moved by the player. Knock out all the tiles within the time limit using the Knight, only able to move in a L shape. As you clear tiles you will leave holes behind that have to be avoided. On later stages you will have to land on tiles several times before they vanish.